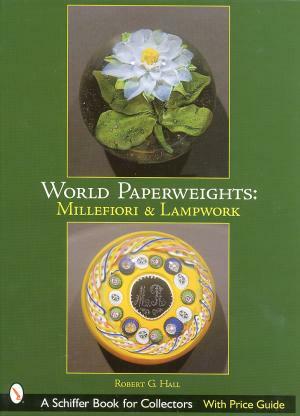 Robert Hall's third book on paperweights covers weights from all parts of the world. The focus is on millefiori and lampwork paperweights, leaving other types such as dumps, abstract designs, bubble weights, and swirls to other books. Included are many types paperweights previously ignored by other books. 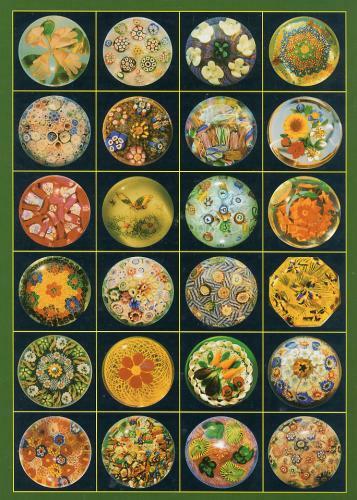 There is great coverage (18 pages) of Chinese paperweights and an interesting chapter on German paperweights (some authors call these Bohemian). The chapter on Making a Paperweight by the American Method features Rick Ayotte at work. The book is packed with detailed descriptions and color photographs of nearly 500 paperweights, each with a price estimate. The descriptions provide information not previously published such as discussions of the evolution of techniques over time and pontil treatments. Included are company histories and other important information about paperweights and paperweight making. This is an important reference because of the range of makers covered. It is indispensable to anyone interest in collecting paperweights from all over. 160 pages with many color photographs. Hard bound. 8 3/4" by 11 1/4". 2001. Click on the picture to see the back cover of the book.